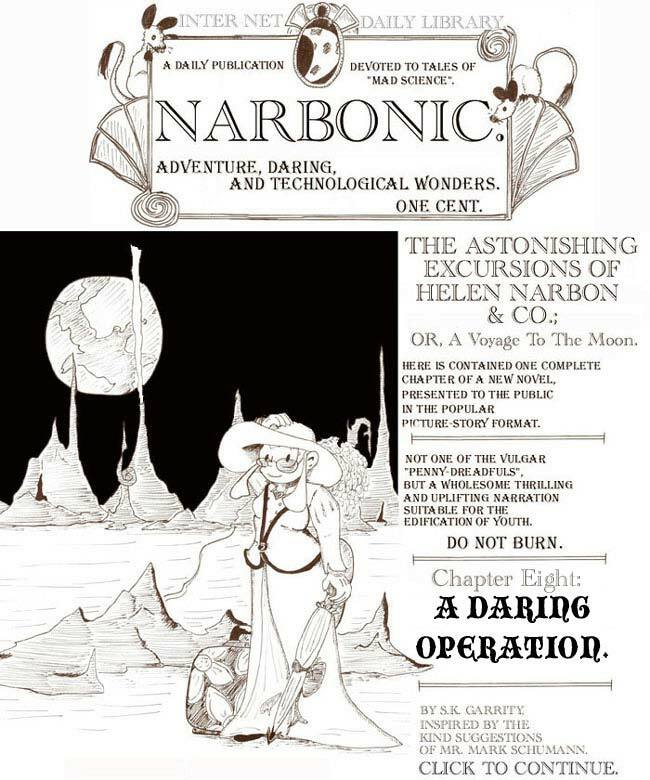 The Astonishing Excursions of Helen Narbon & Co, Chapter Eight. Man, I was getting ambitious with the Sunday installments around this time. Two chapters of the Victorian serial just a few weeks apart, plus “Insanity Claus.” Too bad I was so lazy the rest of the time. 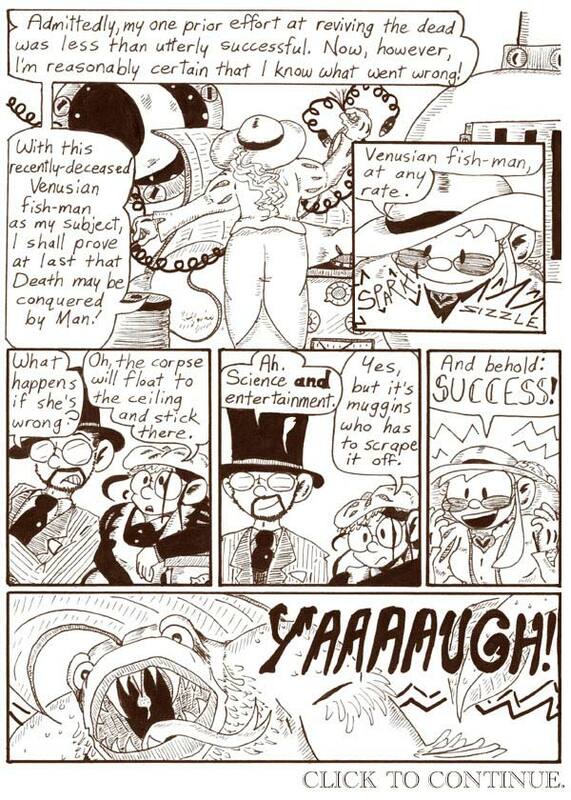 Although I’m obviously unaccustomed to drawing characters from behind, this page looks pretty good, especially the screaming fish-man in the last panel. It’s my first decent drawing of this character. I didn’t realize when I designed him that I’d end up using him so much. Obviously I created this page by pasting the same image of the screaming monster into all three panels. It didn’t quite work because I didn’t leave enough room for the word balloons; the balloon tail in the second panel, especially, is placed all wrong. It was late and I was too tired to futz with it any more. Also, the bottom of the scan is dangerously tilty. All that aside, this page looks pretty good, what with the characters’ varied reactions and the fact that I mostly only had to draw them in profile. Profiles are friggin’ easy. This plot development was inspired by “The Lost World,” a comics serial by Lily Renee that ran in Planet Comics in the 1940s. “The Lost World” takes place on a post-apocalyptic Earth where a small band of humans fights against alien overlords, and at one point one of the human characters gets brain-swapped with one of the alien Voltans. After that he goes around for the rest of the story as a human in a Voltan body. Also, this is unconnected to anything in Narbonic, but I just want to note that the leader of the human resistance in “The Lost World” is a shirtless man with a bow and arrows named Hunt Bowman, which is awesome. 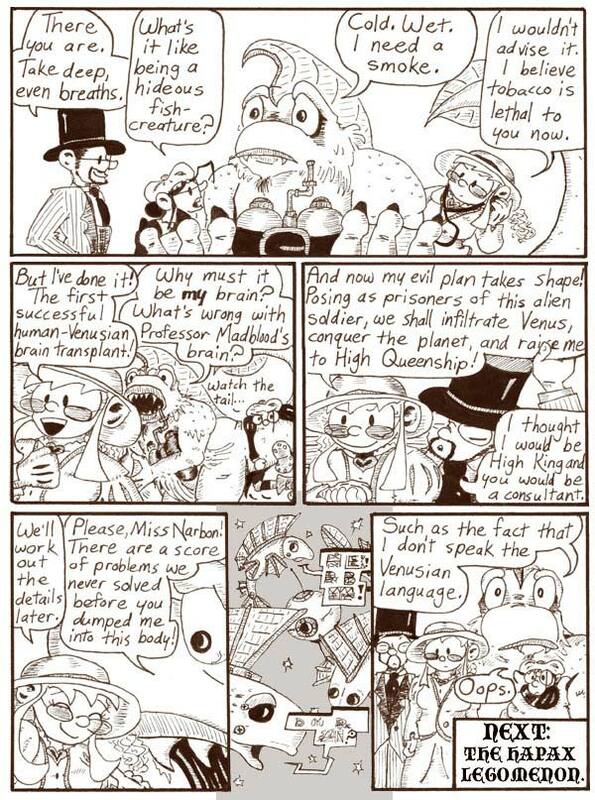 Fiction House, publisher of Planet Comics, was an interesting company. They published a lot of work by women writers and artists, partly because there was a war on and men were in short supply (and partly, I suspect, because they probably didn’t pay very well). They also published a lot of work that was batshit insane, like the comics of the amazing Fletcher Hanks. I wish there were publishers like that today. Oh, poor Victorian Dave. Look at his big damp puppy-dog eyes in the first panel. Even by Dave standards, he takes a lot of abuse in this serial. I like Madblood lifting Helen’s overlarge word balloon. I wish I’d done more stuff like that throughout Narbonic. There was certainly plenty of dialogue wordy enough to warrant the characters getting fed up and shoving it aside. The Venusian “language,” as I’m sure many readers have noticed, is just English with each letter of each word written inside the previous letter, concentrically. It doesn’t always turn out legibly, but you can see that the first two words here are “Hapax Legomenon.” I got the idea from artist Xu Bing’s English-language calligraphy, some of which you can see here. Could we see zoomed versions of the Venusian language, if you have such a thing? I love deciphering such things. It looks to me like the last sentence is “Do you require assistance?” but I’m not certain. Helen looks a bit Jane Narbon-ish in Panel 4.